Another wonderful sketch from Crafts 4 Eternity for today! I hope you all go and give it a try I bet it challenges you to step outside the normal box we tend to keep ourselves in! Why? It is a long card! I like making them but it is a challenge sometimes to use up the space and not be bare looking. This is a great sketch to give you a place to put things, while still allowing open space it doesn't look "nekkid"
he he tricked you by only taking a close up - cause I wanted you to see all the shimmer on the pink paper! How did I do that? Pearl Ex Macropearl! I rubbed it all over the pink! The stamp is from TAC called Hedgehog Blocks (T-877) I stamped it with Memento Tuxedo Black ink and then I colored it in with a combination of my Slick Writer pen in Pink and a Sakura Gelly Roll Pen in white. The tag is cut from the cuttlebug dies for sliders and I mounted it on a full circle to give it a matted look. Ribbon is from my January monthly club package from Really Reasonable Ribbon! Added a few bling pieces at the top and another strip of ribbon and here is what I ended up with! 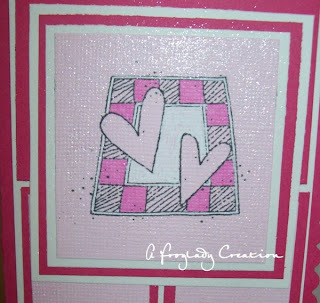 I will be adding this one to the Valentines box to go with the other for the blog candy I am having right now! They cards so far are great and I love the little lines people are adding to them! I hope more start pouring in! Love the pearl ex! You filled the space up quite nicely with the ribbon! Lovely card and thanks for sharing the pearl ex idea. Great card , love the giltz you added! This is a great card! love the BLING!! That would be a hard one to do with the length, but you did a wonderful job!